The Jim Kenney administration is off to a promising start in Philadelphia. One of the mayor’s first acts in office was to end the thoroughly obnoxious practice of letting government honchos park on the sidewalk “apron” around City Hall — a public space. There was a Tumblr dedicated to chronicling this highly visible abuse of government privilege. And ending the practice was on the wish list of urbanist political action group the Fifth Square. During his campaign, Kenney, a former council member, promised to get the cars off the sidewalk. On Monday — his first day in office — Kenney said his administration would begin enforcing the long-ignored rule against parking on the apron. “It’s public space, and should be used as public space,” a spokesperson for the Mayor told Philly Magazine. Jon Geeting of Plan Philly told Streetsblog that while the value of this change is mostly symbolic, it’s still very encouraging. Next step: Rent the land so someone selling coffee at $5 a cup. Suddenly this crappy parking lot is fashionable and chic, and fills the city’s empty coffers as well. European cities figured this out 50 years ago. Way ahead of the Brooklyn Borough President’s office here in “Vision Zero” New York, who wrecked the pavement of their equivalent public space by parking on it, got it redone at great expense, and are back to parking on it again. One warning ticket, then boot them. Excellent step forward for Philly! This was disgusting. 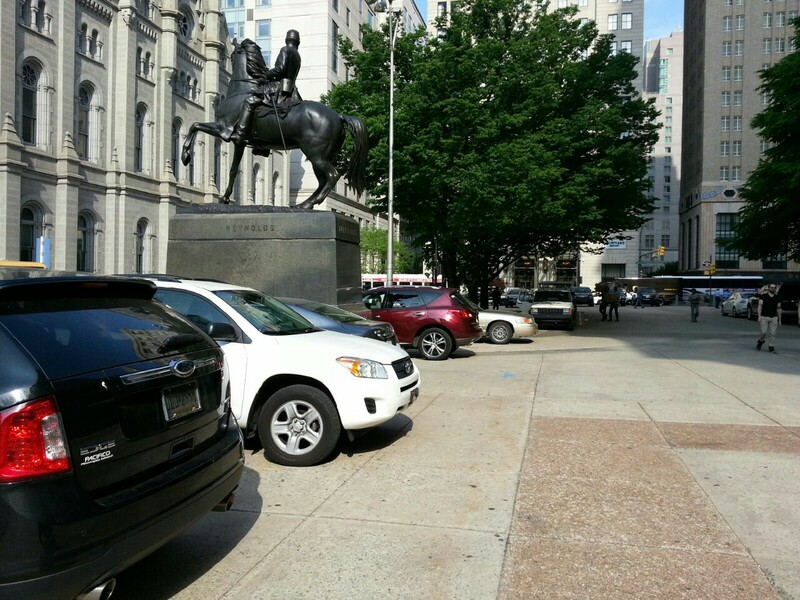 Last time I was in Philly, walking across that plaza, I thought “Can it really be legal for them to park their cars on the sidewalk?” I considered calling a tow truck. This area around City Hall has a *lot* of pedestrian traffic. Stalls and stands would be massively successful. Love the new Dilworth Plaza. Just wish it blended better with the wonderful public space in the center of City Hall. That map at the center of William Penn’s grid is a touchstone for me; something I showed my kids when visiting. But the motor vehicle traffic around City Hall is crazy, and the on-street bike lanes and pedestrian crossings so harrowing there. With so much transit just below ground — trolleys, subways, and regional rail — all the pieces are in place to reduce driving. I guess we need a toll cordon around Center City and higher frequency transit? True, but you also go to La Colombe’s branch across the street. this fabulous chain started in Philly. My guess is that an existing coffee shop would make the plaza even more attractive to coffee drinkers.